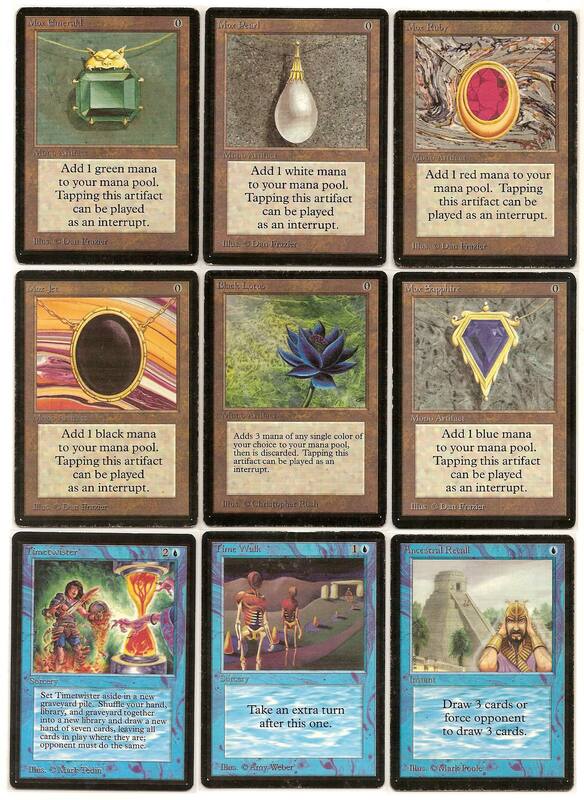 The Power Nine consists of the Black Lotus, Mox Emerald, Mox Jet, Mox Pearl, Mox Ruby, Mox Sapphire, Ancestral Recall, Timetwister, and Time Walk. Today these cards are sought by players and collectors alike, because of their power in the game and their rarity. They are all considered “broken” meaning they are too powerful for their costs and when playing in tournaments where the Power Nine are legal, it’s hard to compete against them if you aren’t armed with them in your own deck. What makes them full of legend and lore? Beyond their rarity, it’s what you can do with them and what has been done with them that consume the Power Nine. Three key advantages that increase your chances of winning are mana advantage, card advantage, and turn advantage. 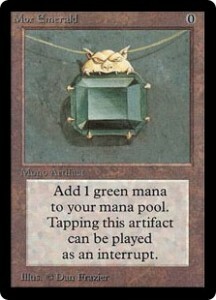 All of these advantages can be had with the Power Nine and all can be had at an extremely reasonable price; a cheap Mana cost, that is, not card value. But the true key to their legend and lore is in the legacy of cards bearing their lineage that have come since. What can I say about the Black Lotus that hasn’t already been said. It’s been responsible for more first turn kills than any other card, ala Channel/Fireball or Disintegrate. And if it’s not killing on the first turn, it’s giving one player an extreme mana advantage early in the game. The drawback, as I’ve come to understand it, is that it’s not quite as useful later in games as it is having it in your opening hand or as an early draw. 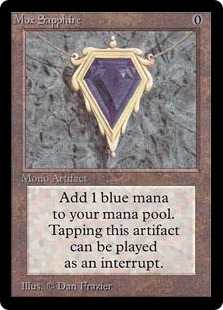 Its three free mana, and the one thing all players need early in games is more mana. Free mana is even better. 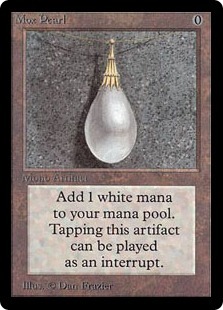 Additionally, it gives you the choice of what color mana it creates, making it all the more powerful and flexible. 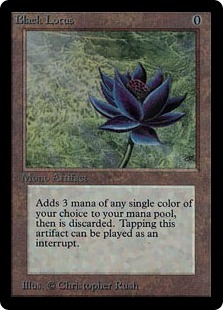 The Black Lotus has a lineage of cards that have come since; Gilded Lotus from Mirrodin, Lotus Bloom from Time Spiral, Lotus Blossom from Urza’s Saga, Lotus Petal from Tempest, and Lotus Vale from Weatherlight, but all of them have a drawback or a mechanism that makes them not nearly as effective as the original. In truth, there will never be another. The Black Lotus stands alone. 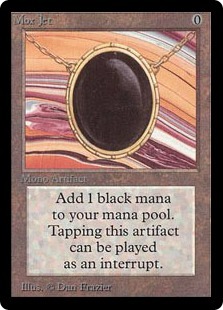 The Moxen – Mox Emerald, Mox Jet, Mox Pearl, Mox Ruby, and Mox Sapphire – like the Black Lotus are great at providing mana advantage. They’re basically lands, but as zero-casting cost artifacts, they can be played additionally to your land drop on any given turn, expanding your mana pool one Mox at a time. Unlike the Black Lotus, the Moxen are not a one-and-done card. Like Lands, they can be used over and over and over again, only once each turn of course. Again we’re talking mana advantage here so if you have more than one in your opening hand, in addition to your first turn land drop, you have the ability to cast cards that would normally be second, third, or maybe even fourth turn spells on your first turn. Again this is a huge advantage. And like the Lotus, the Moxen have a lineage with Chrome Mox from Mirrodin, Mox Diamond from Stronghold, and Mox Opal from Scars of Mirrodin. And like the Lotus lineage, the Moxen lineage cards all have additional costs, they aren’t “just like playing an additional land,” so to speak. What makes Ancestral Recall broken is not only what it does but what it costs to do it. One Blue Mana to have someone draw three cards and it’s an Instant. Card draw advantage has always helped to speed up decks; the fast ones get faster, the slow ones get faster. Truth be told, three cards for one Blue Mana is as cheap as it gets and the flexibility of this card in allowing you to force an opponent to draw three cards is used just as often. I’ve heard stories ranging from using Ancestral Recall for drawing a combo card for the win, to using Recall to force an opponent to deck themselves, and an ever rarer occurrence of someone who used the Recall on an opponent to cast a more powerful Storm Seeker! The legend of this card really knows no bounds, but the proof as to how broken it is, lies in its legacy. I can only come up with five cards with Ancestral Recall lineage; Ancestral Vision from Time Spiral, Brainstorm from Ice Age, Plea for Power from Conspiracy, Enhanced Awareness from Fate Reforged, and Visions of Beyond from Magic 2012. 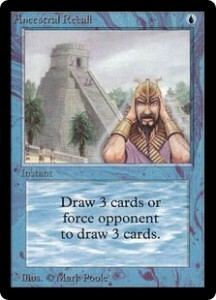 Brainstorm, has a drawback of having to discard two cards, Plea for Power has a chance to be either an Ancestral Recall or a Time Walk and Visions of Beyond only works as a Recall “if a graveyard has twenty or more cards in it.” Enhanced Awareness costs a lot more at four colorless and one Blue Mana, and it does require you do discard a card after drawing three, but it is still an Instant, like Recall. However, Ancestral Vision is truly the closest – it has the same cost and does the same thing, but it has a required Suspend 4, and it’s a Sorcery not an Instant. So there truly is nothing like Ancestral Recall, except the original card. What Timetwister does in one card for two colorless and one Blue Mana, it would take at least two other cards to do. It’s a Feldon’s Cane and Wheel of Fortune all in one. The only downside being that if affects not only you but all players. It’s not a reset button, but it also kind of is. Your graveyard is shuffled back into your library, which is the function of Feldon’s Cane, a deck staple for some. Then you get to draw seven cards, too. And it still only costs you three Mana. Just like with Ancestral Recall, you need only look at the legacy of cards created in its image to find out just how broken Timetwister was. Those legacy cards are Diminishing Returns from Alliances, Time Reversal from Magic 2012, Time Spiral from Urza’s Saga, Temporal Cascade from Mirrodin, and Sway of the Stars from Betrayers of Kamigawa. Diminishing Returns is close, but not only does it cost one additional colorless Mana, but you must exile the top ten cards of your library as part of the cost to play it, and that is after you shuffle your graveyard into your library. Time Reversal is also close, but it cost an additional colorless and Blue Mana to cast and after it is cast, it gets exiled, whereas Diminishing Returns and Timetwister, both go to the new graveyard and could be used again. 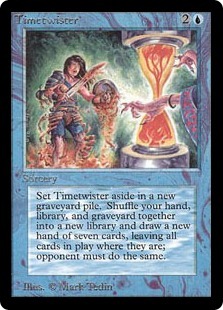 Time Spiral from Urza’s Saga is also close, but costs double what Timetwister does, and it gets exiled just like Time Reversal. On the up side, it’s a “free” spell, allowing you to untap six lands after it is successfully cast. Temporal Cascade allows you to do one or the other for five colorless and two Blue Mana, and becomes a Timetwister only if you use entwine adding another two colorless Mana to the casting cost. Sway of the Stars costs an enormous eight colorless and two Blue Mana, but has the added power of really being a reset button shuffling hands, graveyards, and all permanents in play together, before allowing each player to draw seven cards and resetting each player’s life total to seven. Again, for what it does and what it costs, Timetwister also stands alone. If you like card advantage and Mana advantage, taking an additional turn will give you both as you’ll be able to draw an additional card and play an additional land, in addition to actually having the extra turn. But what makes this card broken is the cost. Just one colorless and one Blue Mana, gets you an extra turn, that’s it, no hassle, no fuss, no drawbacks, just an extra turn. 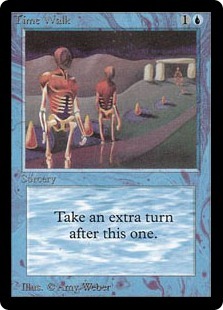 And like the rest of the Power Nine, it’s in Time Walk’s legacy cards that we see just how broken it is. 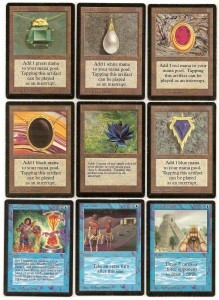 Time Walk has the most legacy cards of any of the Power Nine; Time Warp from Tempest, Temporal Manipulation from Portal Second Age, Capture of Jingzhou from Portal Three Kingdoms, Final Fortune from Mirage, Last Chance from Portal, Warrior’s Oath from Portal Three Kingdoms, Temporal Mastery from Avacyn Restored, Temporal Trespass from Fate Reforged, Stitch in Time from Guildpact, Savor the Moment from Shadowmoor, Second Chance from Urza’s Legacy, Seedtime from Judgment, Notorious Throng from Morningtide, and Beacon of Tomorrows from Fifth Dawn. Time Warp, Temporal Manipulation, and Capture of Jingzhou all give you an extra turn, but all cost three colorless and two Blue Mana, which is three more Mana than the original. Final Fortune, Last Chance and Warrior’s Oath are all cheap, like the original, costing only two Red Mana, but all three state that at the end of that extra turn, you lose the game, if you haven’t won it during that extra turn. That’s quite the cost. Temporal Mastery has an original cost of five colorless and two Blue Mana, but it’s Miracle cost is just one colorless and one Blue Mana, although it gets exiled after use. Temporal Trespass costs eight colorless and three Blue Mana, but if you Delve, you can get that down to just the three Blue Mana, but that’s eight cards into your graveyard and the card itself is exiled after use. Stitch in Time costs an additional Red Mana more than the original, but only works if you win a coin flip, Savor the Moment costs an additional Blue Mana more than the original, but you don’t get an untap phase during the extra turn. Second Chance costs two colorless and one Blue Mana, but it’s an enchantment that only gets activated if you have five or less life during your upkeep. Seedtime is a Time Walk for Green that only works if an opponent cast a Blue spell during your turn. Notorious Throng allows you to put creature tokens into play and take an extra turn, but only if you dealt combat damage to a player with a Rogue and only if you pay the Prowl Cost of five colorless and one Blue Mana. Two Time Walk legacy cards can be used over and over again; Beacon of Tomorrows costs six colorless and two Blue Mana but gets shuffled back into its owner’s library, while Walk the Aeons costs four colorless and two Blue Mana with a Buyback of sacrificing three Islands. And lastly Plea for Power is either a Time Walk or an Ancestral Recall for three colorless and one Blue Mana. With that kind of legacy, it’s easy to see just how broken Time Walk is. 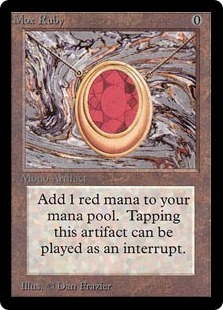 But all of the Power Nine cards were broken and their lore and legacy endure, even if the actual number of playable cards diminishes with wear and time. They are all available somewhere for a price, a King’s Ransom, if you will and they’ve seen some play in the online version of Magic: The Gathering, in addition to its predecessor Shandalar a.k.a. Magic the Gathering: Duels of The Planeswalkers. Sure, there are other “broken” cards, but these are the cream of the crop, the top of the heap, these are the ones that legends are made from and legacies are created from. These cards; Black Lotus, Mox Emerald, Mox Jet, Mox Pearl, Mox Ruby, Mox Sapphire, Ancestral Recall, Timetwister, and Time Walk are the Power Nine of Magic: The Gathering.